Generally it takes around ten years and costs up to €100 million or more to develop a new drug from a promising chemical substance. This is why pharmaceutical industries often are very large companies. The first step (Chemistry in the figure) is to identify one or more potential candidates for drug development, i.e., substances that have good medicinal effects and can possibly be made into drugs. 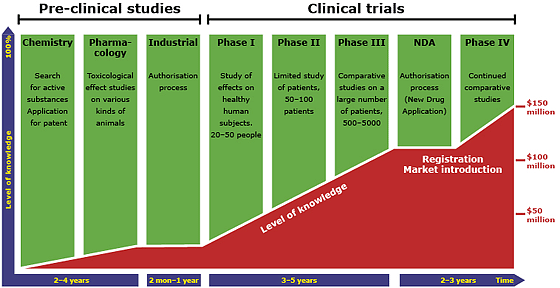 There are various ways of finding interesting candidates for drug development. One way is known as screening. In other words, one designs a pharmacological test in which one examines a lot of substances, plant extracts or something else. When you get a positive effect from the test you have a potential candidate for medical use and the developmental stage can start. The second phase is the detailed pharmacological studies which involve learning more about how the substance affects the body. You also carry out toxicological trials to determine whether the substance is toxic for human beings at low doses. In addition tests are made to examine the effect of the product on the foetus in pregnant animals. Then, too, there are the pharmacokinetic studies on the substance, i.e., how the body affects the substance, e.g., if the human enzyme system breaks down the substance or if it is excreted in an unchanged form. At the same time, an industrial process is developed so that the drug can be manufactured if it gains approval. After this, the national agency for medical products checks the documented results in order to decide if the positive effects of the substance outweigh possible negative ones and that the product is not dangerous for human beings. There may still be adverse effects but only such that do not cause permanent damage. If the authorities approve, then it is time for the next stage in the development. But if they aren’t completely satisfied then further tests must be carried out before the product is approved for clinical trials. The word clinical is used since the new tests will be carried out in clinics, i.e., by a physician on living patients. The first stage is phase I of the clinical trials, which involves giving the substance to healthy volunteers to see if the medicine has any adverse side effects. The study is carried out on 20-50 people and the dose is increased successively during the trial. Blood samples are taken from the volunteers for pharmacokinetic testing. At the same time more toxicological studies are made on animals to ensure that there are no damaging effects. These may well be tests where animals are given the drug over a long period to see, for example, if they develop cancer. The next stage is the second phase of the clinical trials where the product is tested on voluntary patients who suffer from the illness that the drug is designed to treat. This is a larger group consisting of 50 to 100 patients being examined. At this stage it can be determined what amount of the drug is needed to produce a good effect and if tolerance is developed, i.e., if higher and higher doses are needed to achieve the same effect during the course of treatment. Then comes phase III of the trials which involves a large number of patients (500-5 000) being treated with the drug at which time it is compared to previously approved medicines. By now it is known what dose should be given and how it should be administered, i.e., the form of the drug, e.g., tablets or a solution. It is also known what adverse effects can be expected and there is an industrial process in place for production of the drug. Then an application is made to get the drug registered and if all the results are good, if the drug is effective and sufficiently harmless, it will be approved and may be sold as a drug. Even after gaining approval, further scientific trials on the drug are carried out. In order to have sole right to the invention – the drug – it must be patented. Then nobody is allowed to manufacture and sell the same thing. The patent for a drug lasts 15 years and during that time the company must earn enough money to cover the costs for developing the substance and enable the search to go on for new substances which may eventually become new drugs. For every successful drug there are many that fall before reaching the finishing line, i.e., gaining official approval. As soon as the patent lapses, there are companies that make copies of the drug and produce cheaper medicines since such companies have not had the high development costs.